If you ever doubted that the manufactured outrage over the AIG bonuses was intended as a distraction, all you have to do is look at President Obama’s first budget and the deficit projections which have been produced based on it to see exactly what they are trying to divert our attention from. 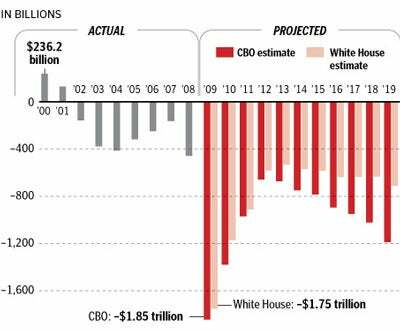 They would prefer that we don’t think about the fact that the Obama administration’s spending is going to dwarf the excessive spending of the Bush administration and drive us into deeper and deeper waters of insolvency which will burden future generations beyond their ability to recover. The Heritage Foundation has crunched the numbers for us, and the Washington Post offers the very effective graphic representation shown to the right. If seeing the two deficits side by side doesn’t alarm you, then you’ve lost your ability to sense impending doom and you might as well be protesting with the sheep outside of the homes of AIG executives in Connecticut. Good article. Being a manufacturer we totally see your perspective.